Skills and abilities: Innate Leader. 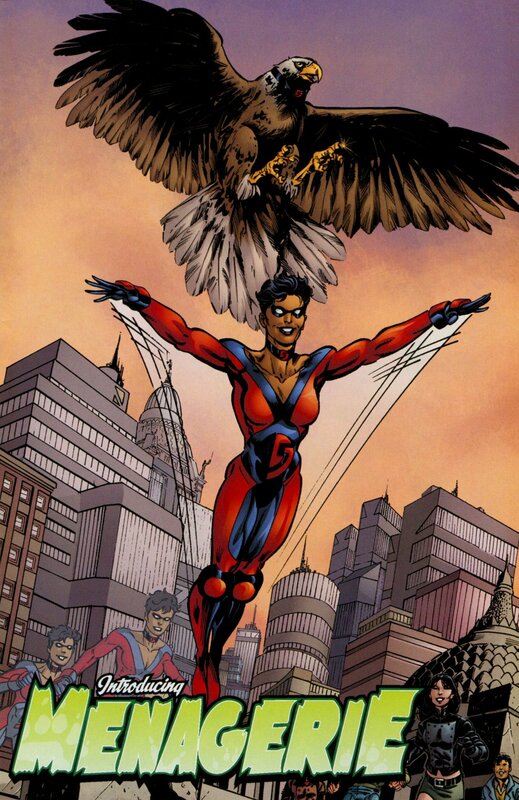 Powers: Originally she had the superhuman ability to fly. Now she has the power to shapeshift thus altering her shape, size, color, texture in order to mimic animals. Olivia Lewis is the biological daughter of Captain Dynamo and an African American married woman. Livvie as she was called excelled in school as the daughter of a high priced Washington DC lawyer. She got into Georgetown University where even as a junior she was already involved in a dozen volunteer organizations. She also had a boyfriend named Derek. After Captain Dynamo died his wife Maddie Warner sought her out to be a part of a team of superheroes to take over her father’s legacy. Here she met her four half siblings. They were then exposed to the same radiation which gave Captain Dynamo his powers some forty years before. This unlocked her ability to fly. Over the next few years along with her siblings they became the protectors of the city and saved countless lives. In battle with another half sibling however Dynamo 5’s powers were stolen. Upon the disruption of the weapon however her and her five siblings had their powers switched around. Now equipped with the power of shapeshifting which belonged to her brother Spencer. Now codenamed Menagerie she continues to fight for truth an justice along side her team/family.